PTTP's new giveaway is brought to you by the generosity of author Cathy Marie Buchanan! 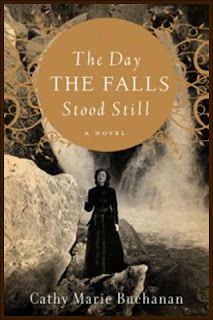 The Day the Falls Stood Still is her first novel and is getting rave reviews on Amazon! We have 1 copy up for grabs. Please leave a comment below with your email address to enter. US and International entries are accepted. SYNOPSIS: Steeped in the intriguing history of Niagara Falls, this epic love story is as rich, spellbinding, and majestic as the falls themselves. Giveaway ends on January 4th. Good luck to all! Awesome giveaway. Please enter me! I am interested in this one! I've been interested in reading this book ever since I first read about it a few months ago. Please enter me in the giveaway. Wow - this sounds fantastic. Unique and intriguing. I especially like the Niagara Falls setting. My husband and I went to Niagra Falls a few years ago for a vacation and we were just fascinated with the beauty of the falls and all that water that has been flowing forever. Please enter me. Hello! Please enter me in this giveaway! Some of my friends on Goodreads have given this book great reveiws too. I'd love a chance to win a copy. Thank you. Thank you.....I'd love to win this one. Great giveaway. Can't wait to read this one. Wonderful!! This book in high on my wish list. Thanks for the chance to win it. I would like to be entered, Happy Holidays! Sounds interesting! :) Count me in! I've read several good reviews of this one. Please enter me. I would love to win this! Thanks for hosting the giveaway! Thank you - what a great giveaway. I've been tempted to scoop this one up in B&N a couple of times. I would love to win it. This sounds like an interesting look at a transitional time in US history. Family dynamics and changing society should make for an interesting story. Please enter me. Many thanks for making it international! Since the first time I saw this book posted about on Marie's blog - I have been fascinated. I would love to be entered for this. I'm interested in this novel! I have really been wanting to read this one! Thanks for the awesome giveaway! Having visited Niagara Falls, and having read a book about Buffalo and the Falls several years ago, I am more than ready to read this novel. It sounds great. The book sounds like my cuppa tea. Please enter me. Oh, I really want to read this one. Please count me in! I would love to read this one. Please enter me in this contest! This sounds like a wonderful story! Thanks for the giveaway! I would love to read this book! It sounds really good! I seem to remember seeing a review of another book written about Niagara a few months ago although I think that was something to do with the dare-devils that actually tried to go over the falls in barrels. I would be interested to see what use the author makes of the Falls. Enter my contact info in your draw! Cover artwork is fab. Looking forward to reading what's between the covers. Thanks for the international giveaway. This sounds like a great book. This sounds like a great love story. This sounds like a fantastic read! Please enter me. Thanks for hosting such a great giveaway. I have heard so many good things about this book - thanks for entering me! laura_carroll[at]yahoo[dot]com. Please enter me in this giveaway! This novel sounds wonderful. This book has been on my *wish list* for quite some time. Please enter me! I've got this one on my TBR list already..great contest! I'd love to read this book - please enter me! Please enter me for this one and thanks for giving your international fans a chance. I want a chance at this! Seems like an interesting read! I think I will love this book! Oh, I do wish I get lucky on this one! I have been to the Niagara Falls and loved it! Of course being with my boyfriend made it even better! I will read this book, even if I don't win it here!